February brings us one month closer to spring, and boasts several holidays of its own. Of course there’s Valentine’s Day, but even more important for dog lovers and owners, February is National Pet Dental Health Month. Great dental health is a vital part of your dog’s overall health, as dental problems can lead to other health problems throughout the body. Normally, you should allow your veterinarian to check your pet’s teeth at least once per year to detect early signs of health problems. However, if you notice any of the following symptoms, get your furry friend to the vet earlier. The bacteria and plaque that form on the teeth cause gingivitis, an inflammation of the gums. The breakdown of the bacteria and food particles cause an intense smell. Don’t let foul dog breath become something you’re accustomed to; take your dog in for a dental visit to get their teeth cleaned. If you notice your dog has a broken or loose tooth or has retained their baby teeth, take him or her into the vet to fix the issue. Also, watch out for discolored teeth or teeth covered in tartar, as these can be early signs of more severe dental problems. Does your pet refuse to eat or are they eating less than usual? Changes in eating habits and behaviors can be a sign of problems in the mouth. Check to see if your pup is eating on one side of the mouth or the other, as having a noticeable deference could be indicative of a sore tooth, gums or something else causing pain in their mouth. When dogs have a sore mouth, sometimes the result is eating less to try to avoid the pain of chewing. Have you ever played tug of war with your dog and noticed blood on their chew toy? Probably the second most common reason owners seek dental treatment, bleeding from the mouth can mean gingivitis, a mouth infection (stomatitis) or abscessed teeth. Pay a visit to your dog’s vet if you notice blood in your pet’s mouth. When you notice your dog showing signs of a painful mouth or if their mouth seems swollen, it is time for a dental check-up. 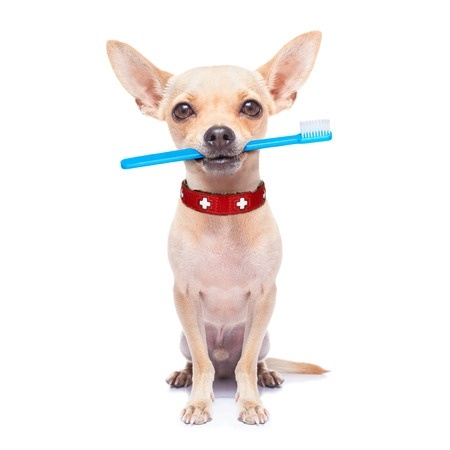 Monitor your pet’s behavior as they eat and play to see if they are favoring one side of their mouth over another, and see if their behavior changes over time – a possible indication of a dental health problem. While February is set aside to recognize pet dental health, keeping an eye on your pup’s teeth should be something to keep in mind year round. Keep these tips in mind or even take a few minutes once a month to check your dog’s mouth for signs of problems to ensure that your dog’s dental health stays great for years to come.